Prior to returning home after a deployment, all personnel will go through a period of decompression. This normally comprises of a formal break away from the operational theatre before returning to your home. This process is designed to place the service personnel into a formal, structured and, most important, monitored environment in which to begin ‘winding-down’ and rehabilitating to a normal, routine environment in order to reduce the impact of post operational stress. Should you however find yourself in the position of needing some help adjusting, there are several routes you can take. Relationship support: The RAF Benevolent Fund provides a whole package of options for you and your partner to explore. Much of which is free of charge to you, or comes at a cost after a set amount of sessions. Mental wellbeing: One in four people will experience a common mental health illness at some stage in their lives and when stress starts to become overwhelming and interfere with your daily life there are places you can go. In particular the new 24/7 Military Mental Health Helpline is available on 0800 323 4444 and is aimed at serving personnel and families (operated by Combat Stress). SSAFA: Providers of practical and emotional support to you both as the serviceman or woman but your families too. Teams are based on most RAF stations and the SSAFA website shares all the various ways in how they can help. 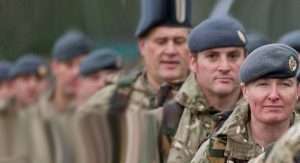 Station RAF Chaplains: He or she can also offer time to you living within the RAF Community.